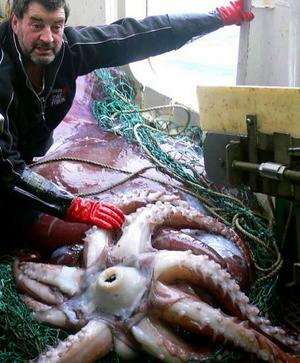 A New Zealand fishing crew has caught an adult colossal squid, it weighs an estimated 990 pounds(450kg) and 10 metres long. It was feasting on a hooked toothfish when it was hauled from the deep by fisherman fishing for the Patagonian toothfish. Colossal squid, known by the scientific name Mesonychoteuthis hamiltoni, are estimated to grow up to 46 feet long and have long been one of the most mysterious creatures of the deep ocean. The animal can move through the water to a depth of 6,500 feet and is extremely active and an aggressive killer. Colossal squid are found in Antarctic waters and are not related to giant squid (Architeuthis species) found around the coast of New Zealand. Giant squid grow up to 39 feet, but are not as heavy. It is believed that the crew on the boat stopped winching in the long-line and spent two hours manoeuvring a net under the squid to haul it aboard. But the scientific knowledge one is likely to gain from this animal is over shadowed by the squid being barely alive when it was pulled aboard. Its death was in honour of scientific researchThe frozen squid is to be transported to New Zealand’s national museum, Te Papa, in the capital, Wellington, to be preserved for scientific study.